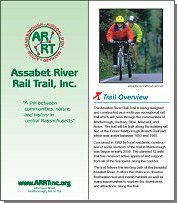 April 2, 2001:The ARRT has created an exhibit at the Marlborough City Library, on the history of the old railroad and the rail trail project. It features several old photographs of the railroad, a map of the new rail trail route and some RR books and artifacts. Thanks go to the ARRT volunteers who put it together, especially Joey MacAloney, Carol Jonietz and Duncan Power. The exhibit will be in the library lobby for the rest of April. Marlborough Residents Urged to Attend City Council Meeting. The Marlborough City Council Urban Affairs committee is reviewing a proposed shopping mall on Fitchburg Street that will use part of the rail line right of way as a road. The mall is expected to have 18,000 cars each day on weekends and 14,000 cars during weekdays. Without proper planning, this mall could confict with the natural intended purpose of the ARRT. Please show your support for proper trail design: a greenspace between the trail and the road and grade-separated crossing of internal mall roads. Committee meetings are open to the public. The City Council phone number is (508) 460-3711. Windfall to ARRT, MBTA to Transfer Hudson Property. In March, the MBTA Board of Directors approved a land transfer of the abandoned Marlborough branch rail line and other properties to the towns of Hudson and Acton at no charge. This will save $381,000 in grant money from the ISTEA awards of 1998 that can now be used for other parts of the project. This new MBTA policy was featured in the Boston Globe West on March 1, 2001. With surplus land conveyances between public agencies, the public should not have to pay twice for the public's land acquisition according to the Globe article. Officials are talking to allow the use of the $381,000 in state and federal money to purchase other parts of the right of way that are currently privately owned in Hudson, Stow, and Maynard along the 13 mile route. Between Marlborough and Acton, approximately 30 acquisitions are necessary to fully implement the ARRT. February 15, 2001: The new ARRT brochure is now finished and ready to hit the presses. The 8 page booklet features new descriptions, color photographs and a map. Look for it soon, in all the best places! If you can't wait, here's a PC version ready for downloading. Getting Ready for Elections. The 2nd annual election of ARRT officers and board is in June. Due to the 25% trail design review in May we will take up elections at the April meeting. Your input is needed.